Director/Screenplay/Photography – Sam Qualiana, Producers – Michael Gesel, Greg Lamberson & John B. Maclay, Music – Michael Paul Girard, Visual Effects – Brett Piper & Arick Szymecki, Miniature Effects – Anomaly Effects, Special Effects – JFR Productions. Production Company – Metroshia Productions. 1999 in a small town in upstate New York. Professor Jonathon Hoffman goes hunting a revived prehistoric shark that burrows through the snow, only for he and his team to be killed. Twelve years later there are a further series of snow shark attacks, even though these are dismissed by local authorities as an urban legend. However, when Sheriff Donald Chapman’s son becomes a victim, he joins the mayor in assembling a team of experts to hunt the snow shark. The gonzo shark film has become its own mini-genre during the 2010s. Jaws (1975) had produced an industry of increasingly more low-budget imitators throughout the 1980s and 90s. By the time of Shark in Venice (2008) and especially Mega Shark vs Giant Octopus (2009), these began a move towards the increasingly tongue-in-cheek, reaching its zenith with the bad movie hit of Sharknado (2013) and sequels. Throughout the 2010s, there have been a great many shark films in a similar vein, all of which celebrate intentionally ridiculous title and conceptual mash-ups – see the likes of Dinoshark (2010), Sharktopus (2010), Sand Sharks (2011), Swamp Shark (2011), 2-Headed Shark Attack (2012), Jersey Shore Shark Attack (2012), Jurassic Shark (2012), Avalanche Sharks (2013), 90210 Shark Attack (2014), Raiders of the Lost Shark (2015), Roboshark (2015), Shark Exorcist (2015), Zombie Shark (2015), Ice Sharks (2016), Planet of the Sharks (2016), Sharkansas Women’s Prison Massacre (2016), Toxic Shark (2017) and Trailer Park Shark (2017), among others. All of these gonzo killer shark films are made by B-budget production companies. While the effects are never great, they are cheaply passable for the most part, while the leads usually consist of some former name star a couple of decades past their glory days and the rest padded out by earnest wannabes with less than a handful of credits to their name. By very dint of the fact that these films require sharks and shooting on or around a body of water, they can’t always be conducted on a next-to-nothing budget. However, there is a special body of gonzo shark movies that do attempt precisely that. These would include 90210 Shark Attack, Raiders of the Lost Shark and Snow Shark: Ancient Snow Beast – all of which would have to count as the most miserable and painful shark films that one has had the misfortune to sit through. 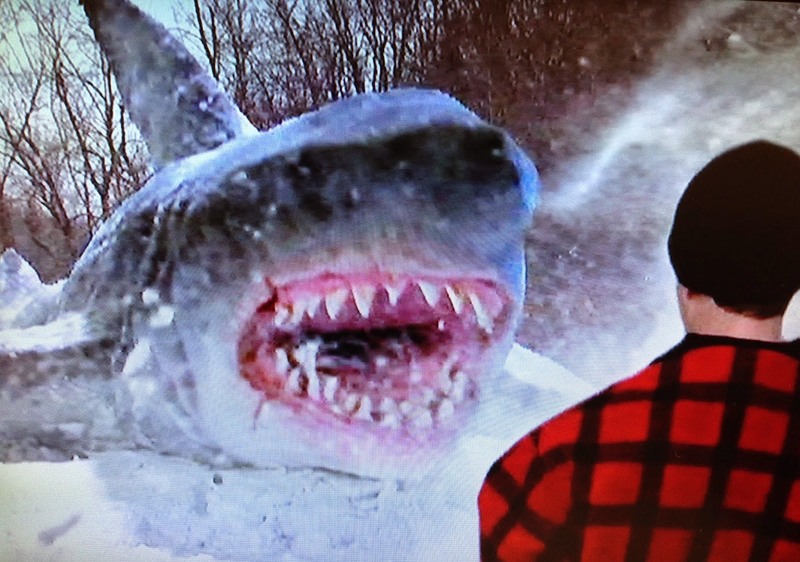 An indication about Snow Shark: Ancient Snow Beast comes from the opening credits, which feature the name of Mark Polonia, the surviving half of the Polonia Brothers duo who are regarded as the modern day equivalent of Edward D. Wood, Jr and are responsible for the likes of Splatter Farm (1987), Bigfoot vs Zombies (2016) and Sharkenstein (2016), plus a long list of others. And Polonia’s name is the only recognisable name on the credits too! And surely enough, Snow Shark: Ancient Snow Beast becomes a painful watching experience. All of the cast are amateurs and there is some very bad acting – in particular a scene in a bar where Michael O’Hear goes on about his obsession with the shark, where his performance becomes so bugged-out as to defy belief. This is not helped by the fact that the dialogue sounds like lead balloons in the mouths of the actors. Added to this, the film has no money for ADR and all of the dialogue has been recorded in situ and left as is. The effects of the shark are cheaply and effectively represented by a fin mock-up being dragged through the snow. Everything else, including the scenes of cast members being devoured, is cheap corner cutting and quick editing, along with the addition of some really fake-looking blood.